We get this understanding from the Holy Bible, which is a library of 66 books, written from about 1500 BC through AD 100. Though written by the pen of human beings, its every word in Hebrew, Aramaic and Greek was inspired without mistakes by God the Holy Spirit. So we use the Bible as the one source of absolute truth, the one guide for every matter of faith and life. As God’s love letter to the world, the Bible informs us about who he really is. There we clearly see he is mysteriously three divine persons and yet one undivided God. We don’t try to rationalize it; we just believe whatever God says in that deep, powerful book of his. Some people get this spark of faith when they hear or read the news about sin and our Savior; others get it as little babies in baptism. Baptism is not taught in the Bible as a decision or dedication we make, but an act of God in the very soul, creating that brand new spiritual life with Jesus Christ. For growing in this new relationship, we know we need the Bible and Holy Communion. These too are the Holy Spirit’s tools for making faith grow and blossom in our lives. We know it is important for our faith to be fed, so we believe regular use of God’s tools is critical against sliding backwards. And, yes, you can lose the new life God has given you. It’s easy to drift away on the wide sea of ideas and philosophies and temptations and worries, like winds that blow, sometimes ever so softly and set our little faith adrift. So we teach and urge everyone to be reading the Bible daily (Here are some tools! 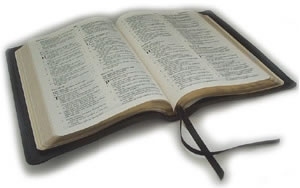 ), to join a Bible study group (sign up here), and to regularly attend worship services. In public worship you can get professional input, enjoy mutual, spiritual construction with others, and also send your thanks and praise to God in a positive, healthy venue. We believe that daily life is not about living for yourself, but discovering your true identity as a dearly loved child of God. He has given every one of his children one or more spiritual gifts that are needed by others around you, in particular in the local church. This means your life is never meaningless or hopeless, but filled with potential and opportunities to make a difference. This means we get to give our Savior high honor, which is our greatest joy. When this life is over, we do not believe our future is questionable. God teaches us to be absolutely secure in Jesus Christ, that he will meet us at that final door and usher us into his Father’s presence to live with him forever. This is the fate of everyone who dies believing in Jesus Christ as their only Savior from sin. Those who do not die with this belief, still have their sins sticking to them, and the outcome will be hell. We do not teach this to scare anyone out of perdition or into heaven; that’s not the way God teaches these things, so we don’t either. We take God’s cue that turning from sin and turning to Jesus in this life is more important than most people realize. There will also be a day of judgment. It will be the second and only other time Christ Jesus will come to this earth. He will be seen by all, suddenly and openly, including by all those who died down through history up until that moment. The dead will be raised by Jesus, and all will be gathered into his presence. Every human will each be judged based on trust in Jesus: Did they look to him as their Savior from sin or not. Any deeds of life that are mentioned will be mentioned as evidence of this faith. We do not fear the final judgment for one simple reason: Jesus. What he did for us in his lifetime and on the painful cross outside Jerusalem means everything, and his resurrection back to physical life is God’s eternal assurance: We have been reconciled to God! So on the Last Day, we know God will not mention our sins (they were erased from our records by his death), and he will welcome us into heaven, which will be the home he makes with us on the earth, which he will renovate on that Last Day. This is our living hope. This is what God teaches us in the Bible. For more details and more teachings, click on this link to our denomination’s web page, or click here to send a question to our church.